This is a review of Country Life’s Maxi Hair Plus. 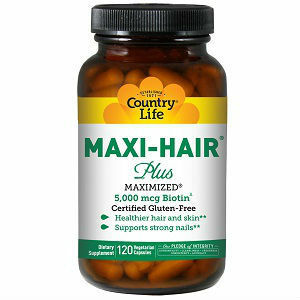 The manufacturer claims Maxi Hair Plus makes healthier skin and hair. Nail strength is also claimed by the manufacturer to increase when you take this supplement. For more information on this product keep reading to find out about the price, guarantees, ingredients and how it can benefit hair health. The main active ingredients in this product are biotin, methylsulfonyl methane, L-methione and the B vitamins. Biotin is an overall beauty enhancer as its enzymes transform carbohydrates, fats, and proteins into energy. This leads to healthy hair, nails, and skin. Keratin and collagen are produced by the sulfur in methylsulfonyl methane, making it beneficial for hair health. Found in meat and dairy products, L-methionine is a building block in our bodies. Building proteins, something our bodies do not do on their own, is what this essential amino acid does. It helps with the health of skin, nails, and hair. Improving thickness, shine, and new growth are a few of the things B vitamins do for our bodies. It’s highly recommended by the manufacturer to ask your physician if this product is something you should be taking. The recommended dose is four tablets a day, and should be taken with food. Cystic acne, upset stomach, migraines, trouble sleeping, and urine which smells bad and is bright yellow in color have all been reported side effects when taking this product. If you experience any of these reactions you should stop taking the product and see your physician. You can buy this product from a host of different websites and it was found with prices ranging from $10.45 to $17.99 with additional shipping charges. The manufacturer offers no guarantees. Where you make your purchase may offer returns for unused portions of this product with a either a partial or full refund of your money, though shipping charges are rarely refunded by any sales point. Maxi-Hair Plus is a vegetarian product and has no artificial flavors, colors, or sweeteners. This product is also gluten free. The low price of this product makes it affordable. Research of consumer opinions and feedback gave results of more than half recommending this product. The less than half who did not give favorable reviews were made up of people, half who had bad side effects and half who did not see any improvement in their hair health. Some reported severe cystic acne which made drastic effects on their skin that in many cases took long periods of time to heal. It is recommended if you take this product and begin to see blemishes to cease taking it before it turns into cystic acne which can leave permanent scarring. Research could not find exactly where the product is manufactured. Because of the reviews and lack of guarantee, this leads us to believe that this product may not be the best option for your hair growth needs. John Brownstone	reviewed Country Life Maxi Hair Plus	on August 3rd	 and gave it a rating of 2.5.